I'm attempting to catch up on all the projects I never posted about, or even photographed, from this year so I can do my end of year review post. Today's post is about a costume I made for a film I worked on with Rogue Zohu this summer. 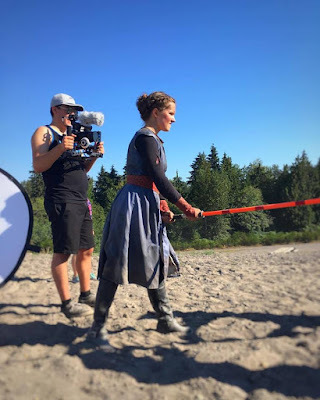 The film was a Star Wars fan film for the Lightsaber Choreography Competition, which is something my sister and I have wanted to do for a couple of years now. Our film ended up with an honorable mention, or the equivalent of 4th place. Working on this film was so much fun but during production we had all sorts of problems, the biggest being that my sister (who plays one of the leads, Desera) ended up breaking her clavicle on the 2nd day of filming. We were never able to finish filming and due to the 3 minute time limit they had to cut the beginning dialog out. Nonetheless, it still turned out to be an awesome short and I can't wait for the "full" version to be released. For this project I co-wrote the script as well as was one of the two Costume Designers. I ended up working mostly on Desera's costume but helped contribute idea's for the other's as well. 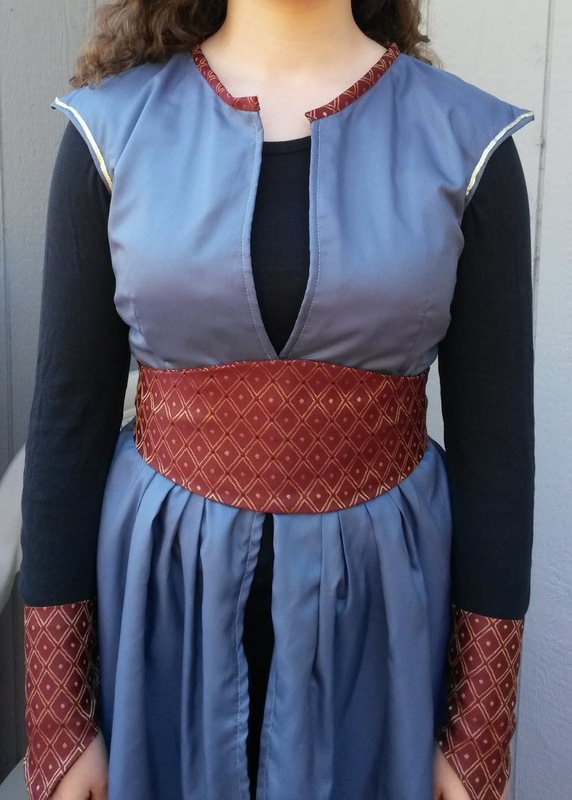 I drafted the pattern/made the tunic, obi, and cuffs myself. 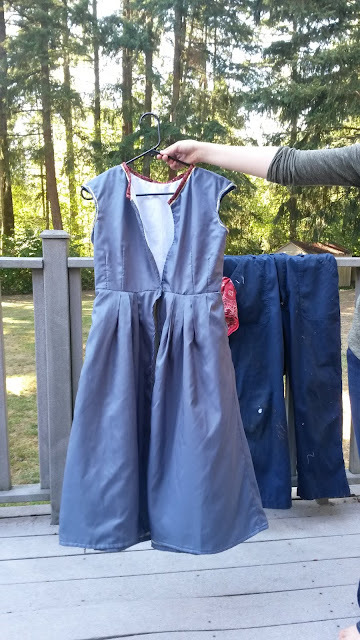 The fabric I used was a cheap synthetic fiber that dirt did not like to stick to. To get the costume as dirty as we wanted we ended up using a combination of real dirt/mud, spray paint, and wood stain. The wood stain was what really made it. Designing this costume was an interesting challenge. The setting for the short is a dystopian Star Wars world torn by war. Desera's a senator trying to end the conflict but one of her opponents/enemy's hired an assassin who abducted her from one of her rallies in order to assassinate her. I had so much fun researching for this because I got to bring out all of my Star Wars books to look for inspiration and design elements to incorporate in the costumes. The main inspiration for Desera was the handmaiden battle outfits from The Phantom Menace. I wanted something that looked elegant but functional. I ended up with a color scheme of red and blue because of the symbolism; blue fors peace and red for spirit and passion, which embodies Desera's character and what she's trying to accomplish. The mostly completed costume. A few design elements were added after. As I already said, I drafted the patterns myself. 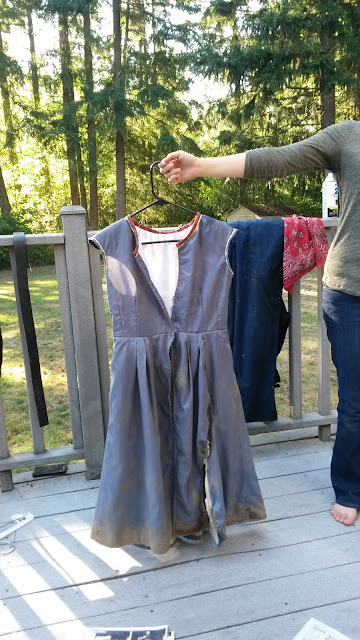 The tunic was pretty simple and is shaped in the front with two darts and the back is made of 3 pieces with princess seams. 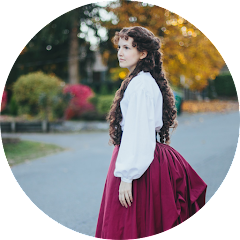 The shoulders are padded and the skirt is a three piece pattern pleated onto the bodice. The obi is bonned to hold it's shape and the cuffs are a simple design that close with snaps. And after distressing. Believe it or not, we ended up adding more dirt after this picture was taken. This was also the first time I distressed a costume. I was a bit worried since I'd never done this before. My biggest fear was that I'd end up distressing it too much. But as it turns out, you simply cannot distress a costume too much. You just can't. We had a rather difficult time getting it dirty and beat up enough. The costumes don't look nearly as rough on screen as they did in person. There were a ton of tiny details about this costume that I wish I could have done a better job on (mostly construction wise), but because of my limited amount of time to make it I didn't have time to fix a lot of things. Though, I'm pretty sure I'm the only one who notices these things. Every time I'd point something out that I wish I could have fixed my sister would tell me that she had no idea what I was talking about because it looked great to her. The curse of being a perfectionist.